Every time I think about the so-called War on Christmas here in the USA, I cannot help thinking about Christmas, the stripper I ‘met’ at a bachelor party a while back. Like many strippers she was quite beautiful. However it was her honesty that really pulled me in, by the cheap tie I was wearing; she told me I was handsome, and that none of the money she was making was going toward college tuition. Im just putting this here for a place holder. While I am not an expert in strippers, Christmas’ most valuable asset was in fact her assets. As many of us reflected later (probably not as eloquently) Christmas was probably the reason that the word callipygian came into being. You may be asking yourself what does the War on Christmas, (the media war, not the actual pin the donkey on the tail variant we all played with Christmas later) have to do with Strippers? I was faced a similar conundrum during the bachelor party when I tried to figure out if Christmas was in fact,wearing a thong as Shawty proceeded to “get low low low low low low low low”. Suffice it to say that there is as much of a war on Christmas, as there was any visible bits of her thong during her rhythmic interpretation of Flo Rida‘s chart topping song: Apple Bottom Jeans. For those of you who do not get subtlety, wedging three strings of floss between two Christmas hams egregiously sandwiched together is an insult to the concept of separation. The War on Christmas is just another jingoistic invective couched in the lobotomised images of a holiday celebrating commercial excesses of capitalism. You know how I know, well George Washington attacked Hessian (German) mercenaries on the day after Christmas during the Battle of Trenton on December 26, 1776. 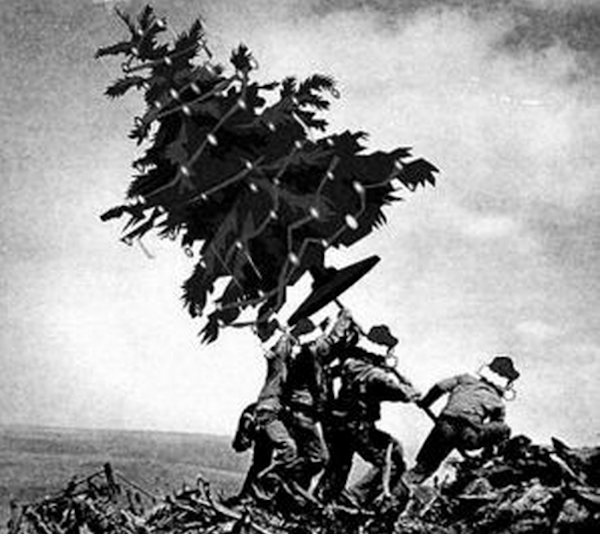 We have gotten it wrong all these years, we should wage War on Christmas. We should take George Washington’s example and attack our future enemies. Luckily according to mass media we should attack: Muslim, Sikhs, country’s where everyone’s skin tone is consistently darker than Rashida Jones. We do not need to attack the Chinese, it seems their government is doing too good a job of exterminating innocents. While there are people who will waste time arguing about separation of church and state, I will tell you that there is no war on Christmas. There are just some people who feel uncomfortable with diversity. If parents do not want their kids praying and their elected officials pass laws stopping prayer in public school, that’s just democracy in action not an attack on Christian Morals. We took the Christ out long time ago. America has no moral fibre; look at the ever-growing poverty in the country, our toppling democratic governments, spying on our neighbours, native American genocide, slavery, how we let corporation exert such strong influence over our democracy, the gradual erosion of civil liberties, all the attention we paid to Miley Cyrus in 2013, our turning a blind eye to the Iraqi use of chemical weapons on the Iranians, the death grip the CIA had during the Cold War on Latin America – should I go on? There will always be on Christmas for me that is neither a symbol or a but a cold hard fact. Posted on December 17, 2013 February 6, 2016 by mrmarymuthafuckingpoppinsPosted in Epic RantsTagged Battle of Trenton, Christmas, Church, Flo Rida, George Washington, Holiday, Holidays, IBM, Jean Baudrillard, Men/Women, Opinions, Religious, Religious experience, Separation of church and state, Treaty of Tripoli, United States.